Sorry for the lack of posts recently! The human took a break due to the loss of a friend, and we didn’t think it pertinent to write without her. But, we are back with an exciting picture! 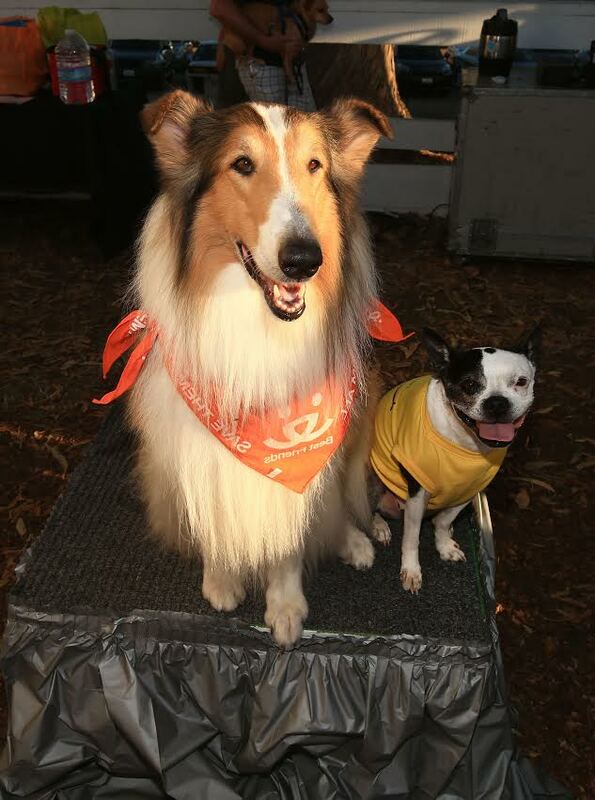 Lassie, the Collie of tv and movie fame, and Luna, a Boston Terrier star in the new movie “Hector and the Search for Happiness,” appeared at the Best Friends Animal Society’s fundraising walk Strut Your Mutt in California. Here are the two dog stars together! Luna is making appearances to help promote “Hector and the Search for Happiness.” The movie is about a psychiatrist, Simon Pegg, who is searching for the true meaning and formula for happiness everywhere he can look. Luna is the dog star of the movie. Other human actors are Rosamund Pike, Toni Collette, Stellan Skarsgard, Jean Reno, and Christopher Plummer. “Hector and the Search for Happiness” opens September 19. You can find out even more from the movie’s Facebook page. Lassie is out and about making appears to reestablish her name and prominence in the public eye. The human is dictating another post all about Lassie’s return which will be on FT in the near future. Strut your Mutt is a fundraising event that happens all over the country to raise money for local shelters and rescues to help homeless dogs and cats. It was awesome to have two famous dog stars make an appearance for a good cause!